Summary: Lobo is a film curiously lacking in passion at times. But it still makes for a tense thriller set against a heady backdrop of violence, deception and intrigue made all the more extraordinary by its basis in truth. 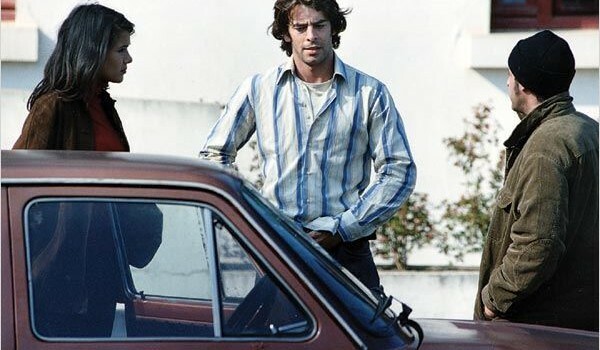 The true story of the man who infiltrated ETA in the 1970s, director Miguel Courtois admits to looking to politically-charged classics like Z and All the President’s Men for his inspiration. And while Lobo is a little too simplistic to really be placed in the same league as either of these movies, it still makes for a fascinating glimpse at a seldom-explored subject matter. Lobo (or ‘wolf’) was the codename given to Mikel Lejarza (here re-named Txema), a construction worker who was employed by Franco’s secret service to go undercover with the Basque terrorist organisation ETA. The film tracks Lobo as he becomes closer and closer to those at the top of the organisation, the head honchos entrusting him with increasing responsibility unaware that he’s reporting every detail back to the authorities. Yet Lobo himself is a victim of exploitation, with the secret services desperate to hang on to any scrap of glory as the country makes the transition to democracy – whatever the human cost of that glory is. Even with ETA’s recently-announced ceasefire Lobo can’t have been an easy movie to make. While the 1970s does lend the story a little distance, this is still a film that portrays both the terrorists and the authorities in an equally unflattering light. The contemporary implications of the film are obvious, both in the dialectic between politics and violence and the self-defeating nature of fighting brutality with brutality. But how to make a film that’s both politically astute yet doesn’t require the audience to absorb an entire history book to understand the film? In fact the film stumbles in pandering a little too heavily to mainstream sensibilities. Much of the dialogue over-simplifies its characters’ motives that should seem fairly obvious to those with a basic knowledge of the conflict (“the Basque have a separate language and culture!”), while the slo-mo gunfights and period pop songs feel oddly ill-fitting in a political thriller. But then maybe it’s best not to view Lobo simply in terms of a ‘political thriller’. At times the movie actually feels closer to the Hong Kong ‘mole movies’ like Infernal Affairs and City on Fire rather than the blistering polemic of Z. And in terms of a mainstream thriller (albeit one with an unusual backdrop) Lobo does work well, Courtois skilfully ratcheting up the tension as Txema struggles to maintain his cover while becoming isolated from everybody around him. Courtois goes in for a similar mix of grainy visuals and hand-held camerawork as Munich and Syriana, and his background as a documentary film-maker really befits the story, lending it an edge and immediacy as events unfurl. Noriega meanwhile makes for a strong, charismatic lead in a role that demands him to travel through every conceivable emotion, though the camera perhaps overplays to the Tom Cruise-style funnelled brow and smouldering looks. Michelle Doutey’s love interest has far less depth, but she still convinces as her character becomes increasingly (and unquestionably) radicalised by ETA’s violent tactics. Lobo is a film curiously lacking in passion at times. But it still makes for a tense thriller set against a heady backdrop of violence, deception and intrigue made all the more extraordinary by its basis in truth.